A day full of adventure among the natural wonders of Krka National Park with its breathtaking waterfalls and a pleasant river cruise as far as a picturesque town where we enjoy a delicious lunch. We leave the port by coach and embark on a pleasant south-bound sightseeing tour of Dalmatia during which we can observe the typical charming Mediterranean nature. 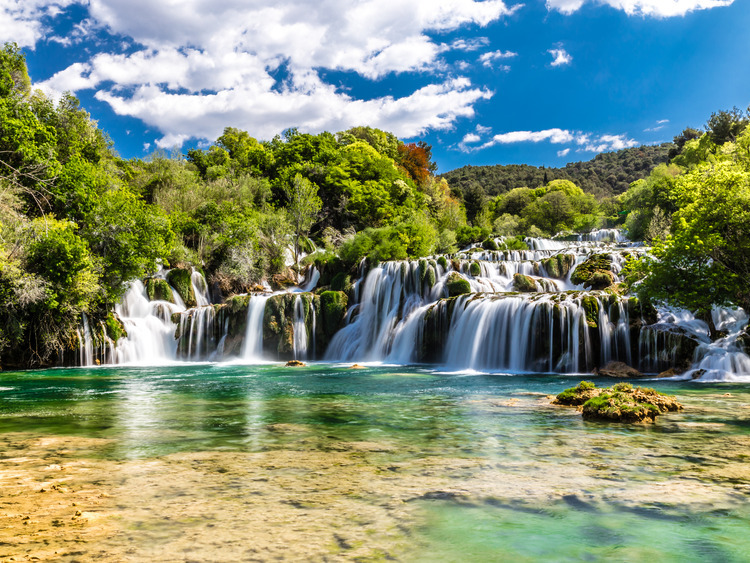 Our destination is the Krka National Park, a protected area of around 14 hectares of land that takes its name of the river that runs through it. We stop to admire the park’s beating heart, where the river generated seven amazing waterfalls including the spectacular Skradinski Buk, a 45 metre drop cascading over 17 natural travertine barriers. We then visit a few water mills and the nearby ethnographic museum recreating a typical Dalmatian village with its perfectly restored stone houses. After some free time to visit the park at our own leisure, we get on a boat for a river cruise as far as Skradin, a small picturesque town on the river Krka. Once there, we make our way to a local restaurant where we enjoy a delicious lunch before heading back to Zadar. This excursion includes a long walk on uneven ground, it is therefore not recommended for guests with mobility problems. Comfortable walking or hiking shoes are recommended. This excursion includes a flight with 194 steps. Do not forget to bring a hat, sunglasses and sun cream.